I work Saturdays and fully expecting my legs to seize up if I’m sat at the computer all morning, so I do all the jobs that don’t involve sitting down. A lively photo shoot involving children and dogs see’s out the afternoon. It isn’t until watching the England match that my legs start to complain slightly. 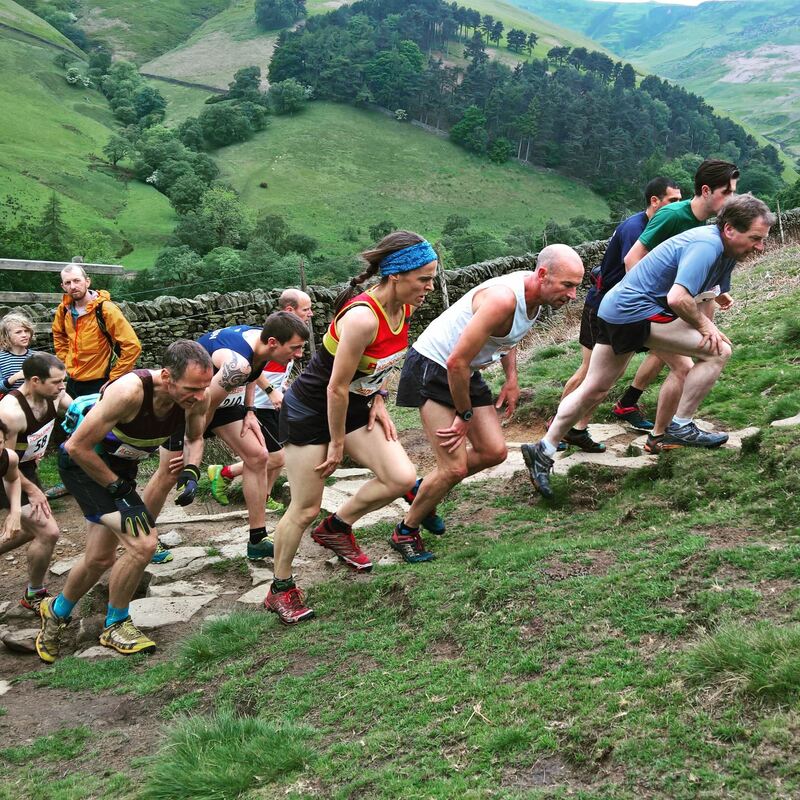 I spend the second half shifting position all around the living room and slightly stretching to relive the discomfort fully expecting to wake up Sunday morning unable to make the foot drop out of bed let alone the 1300ft of Edale. But a strange thing happens; I wake up early and feel ok and my legs don’t complain as I head downstairs for breakfast. Kit grabbed, I set off for Edale. The car park’s open but as I park on the bulrushes I do wonder on the odds on getting out again. Down to the village hall to register, I ask about kit requirements and I’m told to “engage brain”. 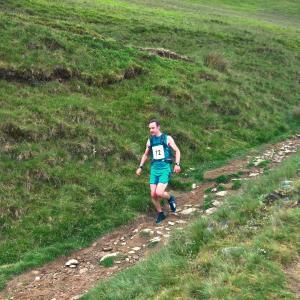 Thinking the odds of an injury are higher due to tiredness I do, and don’t drop the bag back at the car as I swap to my training designated pair of Roclites rather than the still soaking wet race pair from Castleton. The first challenge of Edale, I’ve been reliably told, is the hill at the start. Its not. It’s finding the start. Up through the village over a bridge and into a field following the sound of the junior race just finishing. I’ve got some time so I decide to try and wake everything up with some drills along the path. This doesn’t feel great, no twinges but just not feeling all that energetic. Looking at the hill I’m thinking this could be a big mistake. 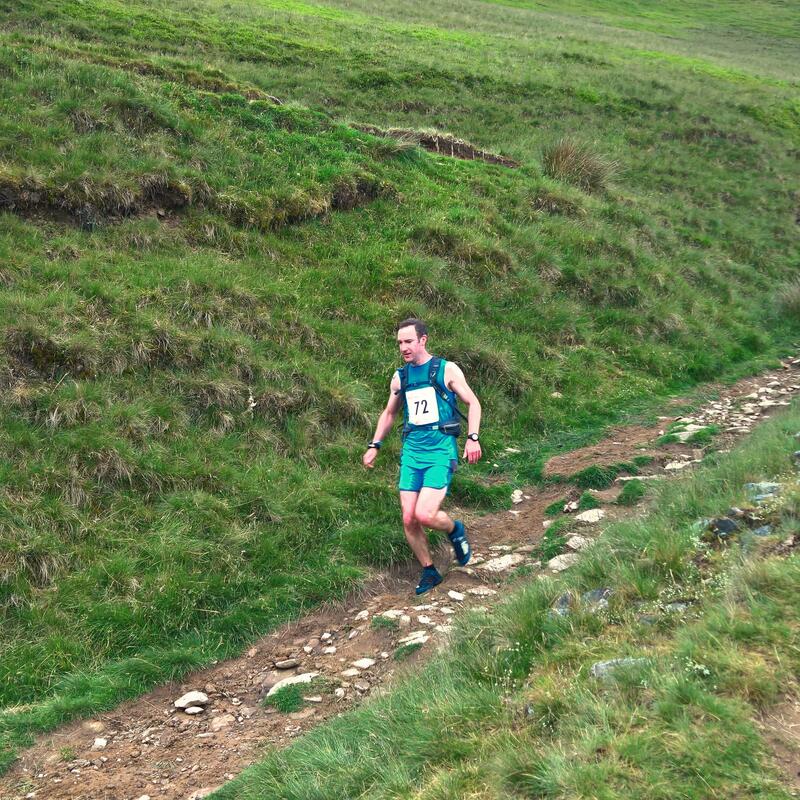 This isn’t helped by the look on most people’s faces when I mention the Castleton race. A pep talk with a couple of people who know the route forms a plan in my mind. Walk the hill, run the top, stick to the path on the way down, get round. The start’s fast up the hill, but just as quickly slows to a hike as people funnel through the first gate and turn right up where the path steeply continues. Walking the steep bits through the zigzags and running some of the flatter sections I look back and seem to be solidly in midfield. 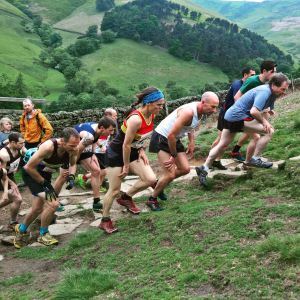 Moving into a run, the path undulates as it turns towards Ringing Roger and then climbs sharply up to the Kinder plateau, and my legs go into that slightly numb territory leaving me wondering if I’m going to be running the top section at all. Onto the gritty path along the edge of the plateau and thankfully they start to come back to me slightly, I gain a place by leaping onto a boulder that the lass in front of me has stopped to mantle her way onto, must have some energy somewhere then! The undulating path leads to the first major route choice of the race, stick to the edge path or hop over a stile and follow a sheep trod through the heather; supposedly quicker if dry, but best avoided if wet. It’s definitely wet so I do the sensible thing and take it anyway. It’s a bit soft under foot, the first part climbs and I start to slow again. The guy in front of me kindly plows straight into the only section of bog we’ve come across with enough time for me to skip round to the left of it, a shout of “cheers” doesn’t seem to endear me to him. I rejoin the main path at a rocky stream crossing, with a very bewildered family stood in the middle of it. I look back along the ridge and I’m pretty sure I’ve gained places. This morale boost makes it way to my legs and I seem to have some spring back as I make my way along to Grindslow Knoll. At the bottom of the final climb I notice that my double knot tying skills have failed me again and my left shoes come undone, I elect to stop and retie it and promptly lose two places for my efforts. Better that than losing the shoe halfway down the descent to come, and what a descent! I pause at the top of Grindslow to neck a gel and get my bearings. The path goes off to my left but the two people who pa ssed me on the hill are heading straight down a grass bank that cuts the corner off and rejoins the path at a gate. Before I know it I’m following them, being a bit over cautious as I nearly end up on my backside but just about keeping my footing. Through the gate and down the path which changes gradient from steep to very steep and back again. My sheep tendencies reemerge as I follow the two runners in front of me onto the grass and down a ridge that appears to cut another corner off. I’m expecting to drop out near the bottom but my direction is off and we rejoin the path. I move left to overtake the lady in front of me promptly finding myself hurtling towards a mound with a 3 foot drop the other side of it. Swearing rather loudly, I somehow make it down the drop without the expected spill. I repeat this slightly further down the path just before rounding a corner to a view of everyone else coming down the grass bank I thought I must be on earlier. The path straight lines to a gate, that takes us down through the last field. A runner coming from the grass bank kindly gives me right of way as I hurtle through the gate and aim for the far right corner and the trail through the woods down to the dreaded tarmac. He comes past me just before the turn up the back of the Show field. I follow him and three other runners, along the last stretch. A lot of cheering before the last corner for the bloke in front picks me up and I sprint for the line finishing right on his shoulder. That kind of energy never shows up 1km earlier does it? 50:05 on the watch and I can barely get a sentence out to answer the guy who’s just started asking me about the race. I just about manage a thumbs up and cunningly spy the massage tent where I take a seat on the table just as the heavens open.